Taylor Martinez on a first-half run. UM: D.Robinson 10-46; F.Toussaint 15-38; J.Gallon 3-17; R.Bellomy 5-0; V.Smith 4-minus-6. NU: T.Martinez 14-58; A.Abdullah 24-101; A.Cross 2-4; TEAM 1-minus-3. UM: J.Jackson 2-14; V.Smith 2-11; J.Gallon 2-9; R.Roundtree 1-32; D.Gardner 1-15; J.Kerridge 1-12. NU: K.Bell 2-51; K.Reed 2-23; B.Cotton 2-21; Q.Enunwa 2-14; A.Abdullah 2-4; S.Osborne 1-19; T.Marlowe 1-16; J.Turner 1-12; C.Zimmerer 1-6. Seung Hoon Choi blocks for Ameer Abdullah. Click image for more Dennis Hubbard photos. Blackshirts Lead NU Past No. 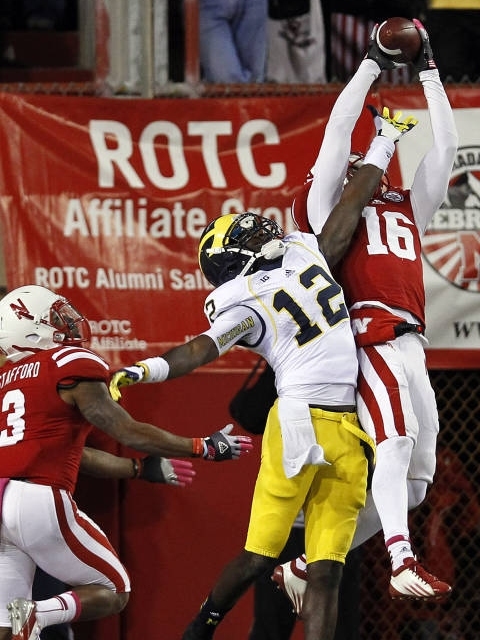 20 Michigan: The Nebraska Blackshirts mustered their best defensive effort of the season, holding Michigan to just 188 total yards and no touchdowns in a 23-9 victory over the No. 20 Wolverines. 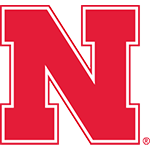 In a game controlled by the defenses, Nebraska quarterback Taylor Martinez engineered the game’s only two touchdown drives in his duel with Michigan dual-threat quarterback Denard Robinson, who left the game with an injury late in the first half. Stanley Jean-Baptiste picks off a pass late in the game. Say this for Pelini’s crew: It reflects its coach in that it has plenty of fight. If you take the reward of using a running quarterback, you have to accept the other side. You lose players over the course of a season. It’s the replaceable parts that win games and championships. Lavonte David … was watching from the Husker sidelines, and he must have enjoyed what he saw. Saturday was a nice win for the Huskers, but as we know nothing with this team is guaranteed. It’s hard to say the Blackshirts deserve anything other than an A+. Saturday’s game was more notable for what it wasn’t – a game that mattered – than what it was. The pressure will be even higher next week. And the week after that. And the week after that. Make no mistake: Michigan wasn’t firing even when Robinson was in the game.